Not to be confused with German author Wilhelm Jensen (1837–1911). 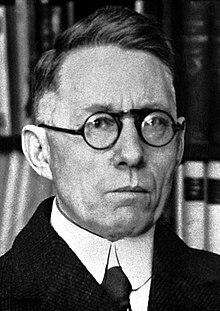 Johannes Vilhelm Jensen (commonly known as Johannes V. Jensen; 20 January 1873 – 25 November 1950) was a Danish author, often considered the first great Danish writer of the 20th century. He was awarded the Nobel Prize in Literature in 1944 "for the rare strength and fertility of his poetic imagination with which is combined an intellectual curiosity of wide scope and a bold, freshly creative style". One of his sisters, Thit Jensen, was also a well-known writer and a very vocal, and occasionally controversial, early feminist. He was born in Farsø, a village in North Jutland, Denmark, as the son of a veterinary surgeon and he grew up in a rural environment. While studying medicine at the University of Copenhagen he worked as a writer to fund his studies. After three years of studying he chose to change careers and devote himself fully to literature. He developed his theories of evolution in a cycle of six novels, Den lange rejse (1908–22), translated into English as The Long Journey (1923–24), which was published in a two-volume edition in 1938. This is often considered his main work in prose, a daring and often impressive attempt to create a Darwinian alternative to the Biblical Genesis myth. In this work we see the development of mankind from the Ice Age to the times of Columbus, focusing on pioneering individuals. Like his compatriot Hans Christian Andersen, he travelled extensively; a trip to the United States inspired a poem of his, "Paa Memphis Station" [At the train station, Memphis, Tennessee], which is well known in Denmark. Walt Whitman was among the writers who influenced Jensen. Jensen later became an atheist. Jensen's most popular literary works were all completed before 1920, a year which also marks his initiation of the 'Museumcentre Aars' in the town of Aars in Himmerland. After this he mostly concentrated on ambitious biological and zoological studies in an effort to create an ethical system based upon Darwinian ideas. He also hoped to renew classical poetry. Jensen was a controversial figure in Danish cultural life. He was a reckless polemicist and his often dubious racial theories have damaged his reputation. However, he never showed any Fascist leanings. Today Jensen is still considered the father of Danish modernism, particularly in the area of modern poetry with his introduction of the prose poem and his use of a direct and straightforward language. His direct influence was felt as late as the 1960s. Without being a Danish answer to Kipling, Hamsun or Sandburg, he bears comparison to all three authors. He combines the outlook of the regional writer with the view of the modern academic and scientific observer. In 1999, The Fall of the King (1901) was acclaimed as the best Danish novel of the 20th century by the newspapers Politiken and Berlingske Tidende, independently of each other. ^ "The Nobel Prize in Literature 1944". Nobelprize.org. Nobel Media AB 2014. Web. 2 Feb 2017. ^ Jensen, Johannes V. (c. 1945). "Johannes V. Jensen – Autobiography". The Official Web Site of the Nobel Foundation. Sweden: Nobel Web AB. Retrieved 24 November 2009. ^ Martin Seymour-Smith (1985). The New Guide to Modern World Literature, 3rd ed. p. 1101. ^ Nobel Lectures, Literature 1901–1967, Editor Horst Frenz, Elsevier Publishing Company, Amsterdam, 1969. ^ Flynn, T. (2007). The new encyclopedia of unbelief. Amherst, NY: Prometheus Books. "Danish atheists include the authors...Johannes V. Jensen." ^ "Århundredes danske bog". litteraturpriser.dk. Retrieved 2014-08-08.